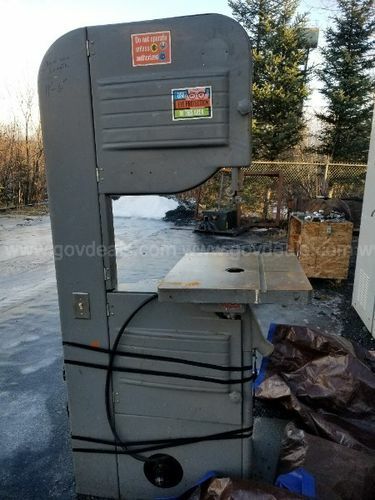 I have been in the market for a band saw for about three years. 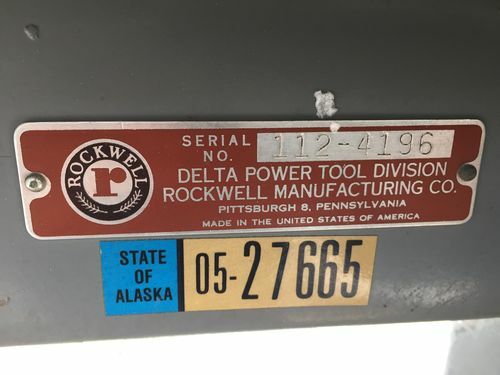 Old iron isn’t as abundant in Alaska. I bought this saw sight unseen. The auctions timing wasn’t great, wife was giving birth that week and couldn’t make the 8.5 hr drive to check it out. I don’t ever expect the person who lists these auctions to provide accurate or detailed information. By the picture, I could tell I was looking at a 28-350 from the 50’s or 60’s. Went over to owwm and it looks like a 1951 model. When I got it to the shop today, I saw that the original guides are on the machine and complete. Next I checked the motor so I could order the right VFD. To my surprise, it’s one of the dual voltage 1 hp motors. I have a 1956 unisaw with the 1 hp bullet motor, they look nothing alike. Most of the information that I have gathered was based on the saw having a 3 phase motor. 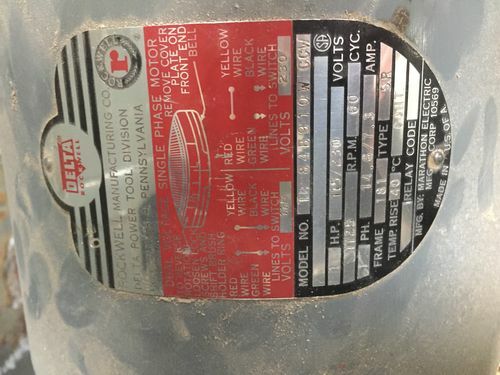 Does anyone know more about this motor and what is the hp equivalent in today’s standards. Thanks in advance! That is a 1954 saw, and it looks like a 1hp single phase motor made by Marathon for Delta – unless I’m seeing things. That is a 1954 saw, and it looks like a 1hp single phase motor unless I m seeing things. You were just the guy I was hoping would reply. Will I see a significant power advantage wiring it for 220? None. Also, how did you determine it’s a 28-350? 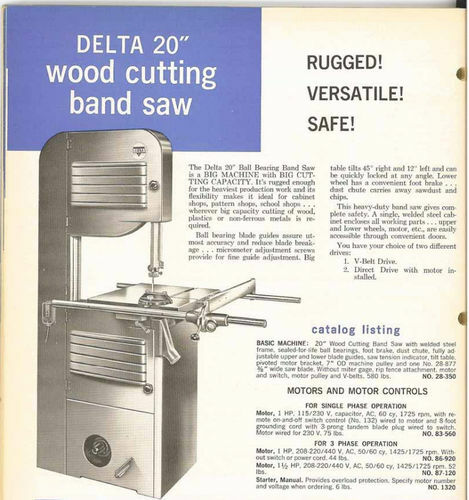 In 1954, they only offered two band saws – and a 28-350 isn’t one of them :) Perhaps you meant catalog number 28-305? Wood/Metal 14” model on an enclosed cast iron stand (28-307 is the same but on an open flared leg stand). 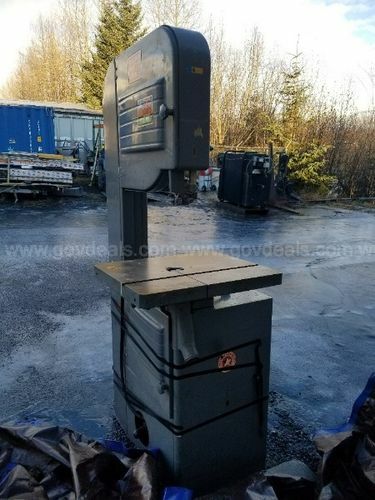 Saw itself is a model 880. In 1954, all they offered was the 14” cast iron models, either wood only or wood/metal. I agree about selling them before 4. It’s so hard to get rid of something when it’s in its prime. So, what saw did I just buy??? Yup, it’s a 20 incher! Serial number places it as 1954 but they didn’t show up in the catalogs until 1955 – so you apparently got one of the first ones out of the factory. Nice score for what you paid! Whoa! Is that the least efficient motor of all time or what is going on? That’s good news, and thank you for the reply. I read a lot of your responses and have learned a fair share. Your knowledge and willingness to share is appreciated. 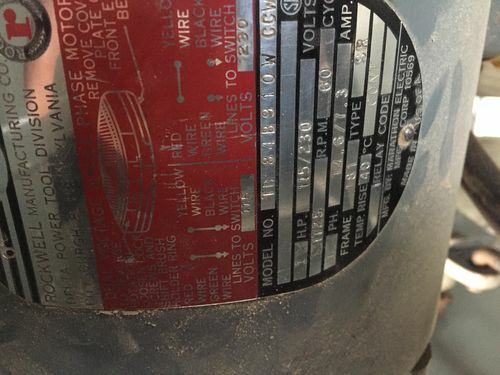 I have never seen a 1hp motor rated at 14+ amps on the badge. It’s one thing to see it on a chart but another to see it on the label. They were probably just being more honest than most. Haha, back when this motor was built, efficient meant it would still be working at 64 Years old. The cost of electricity where I’m at is unreal. I have been lucky to acquire a decent collection of old machines. Two pm 66’s from 1985. A pm 60 from 1984. A Delta unisaw from 1955 and this latest find. If I’m wondering where all my time has gone, the electricity bill reminds me. Old motors may have been less efficient but I have a pile of motors, most older than me, the amp ratings are all pretty typical for the HP rating. And if you use the HP calculator at brads link it doesn’t jive with the chart. Same website so what’s the difference?